The Greensboro Sit-Ins were non-violent protests in Greensboro, North Carolina, which lasted from February 1, 1960 to July 25, 1960. The protests led to the Woolworth Department Store chain ending its policy of racial segregation in its stores in the southern United States. The Greensboro Sit-Ins were the first prominent sit-ins of the civil rights movement. The “Greensboro Four,” the four young black men who staged the first sit-ins in Greensboro—Ezell Blair Jr. (now known as Jibreel Khazan), David Richmond, Franklin McCain, and Joseph McNeil—were students at North Carolina and Agricultural and Technical College. They were influenced by the non-violent protest teachings and strategies of Mohandas Gandhi, as well as the early freedom rides organized by the Congress of Racial Equality (CORE) in 1947. Blair, Richmond, McCain, and McNeil planned the protest carefully, enlisting the help of a local white businessman, Ralph Johns, to put their plan into action. That plan was simple. They would first stop at Ralph Johns’s store so he could contact a news reporter. They would then go to Woolworth’s Five and Dime store in downtown Greensboro and sit at the lunch counters where they would ask to be served. When they were denied service, they would refuse to leave. They would repeat the process daily as long as it took to desegregate the lunch counter. They also hoped their protest would attract widespread attention to the issue and pressure Woolworth to desegregate. 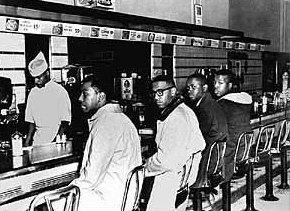 On February 1, 1960, the four sat down at the lunch counter inside the Woolworth store. Woolworth’s lunch counter policy was to serve whites only and the staff, which included black employees, refused the four men service. The store manager, Clarence Harris, asked them to leave, but the four men stayed until the store closed that night. The next day, more than twenty black students joined the sit-in including coeds from Bennett College also in Greensboro. White customers harassed the black students and the lunch counter staff continued to refuse them service. News reporters and a TV cameraman covered the protests the second day as the Greensboro community and eventually the nation and the world learned of them. On the third day, more than sixty people came to the Woolworth store. On the fourth day, more the three hundred people took part in the protests which now included the lunch counter at Greensboro’s Kress store (now K-Mart). As the sit-ins occurred in Greensboro, students from other North Carolina sites, including Winston-Salem, Durham, Raleigh, and Charlotte, staged similar protests. The sit-in movement spread to Nashville, Tennessee; Atlanta, Georgia; and Richmond, Virginia, by early March. The Greensboro Woolworth’s finally served blacks at its lunch counter on July 25, 1960, when manager Clarence Harris asked four black Woolworth’s employees—Geneva Tisdale, Susie Morrison, Anetha Jones, and Charles Best—to change out of their uniforms and into street clothes. The employees then ordered a meal at the lunch counter, becoming the first African Americans to be served at Woolworth’s. Most lunch counters around Greensboro would be desegregated over the next few weeks. The Greensboro Sit-Ins were the catalyst for the formation of Student Nonviolent Coordinating Committee (SNCC) which would become one of most important organizations of the Civil Rights Movement in the 1960s. The International Civil Rights Center and Museum in Greensboro, North Carolina, has collections related to the Greensboro Sit-Ins. “Greensboro Sit-Ins,” North Carolina History Project, http://northcarolinahistory.org/encyclopedia/greensboro-sit-in/; “Greensboro Sit-Ins,” History, http://www.history.com/topics/black-history/the-greensboro-sit-in; “Greensboro Sit-Ins,” North Carolina Museum of History, https://web.archive.org/web/20110125173028/http://www.ncmuseumofhistory.org/collateral/articles/Greensboro.Four.pdf.